Posted on May 19, 2014 at 9:01 pm. Lately I’m finding more and more reasons to love downtown Phoenix and the growing convergence of arts culture and thoughtful urban planning. 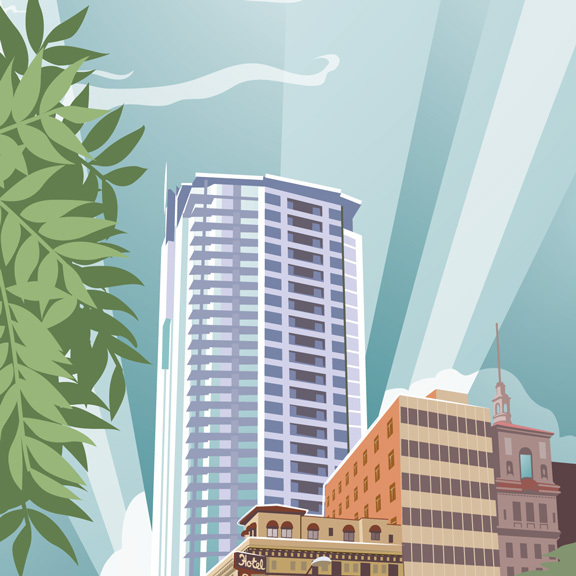 Last fall I illustrated a cover for the Downtown Phoenix Directory. The directory helps visitors and locals get their bearings on the Phoenix grid, and this was a great opportunity to showcase the city. It was important that I emphasize some of the unique downtown skyline while featuring the new “pedestrian-friendly” travel lanes. Pick up a copy pretty much anywhere downtown and GO EXPLORE! I had to pull two street blocks together from a single viewpoint. Monroe running east from Central to 1st St. If downtown has a drawback it’s the large street blocks of unbroken concrete (parking garages) in this area. Composition sketch to make sure it all fits. I cut-out a large building on the left to make room for the view and added some greenery back in. 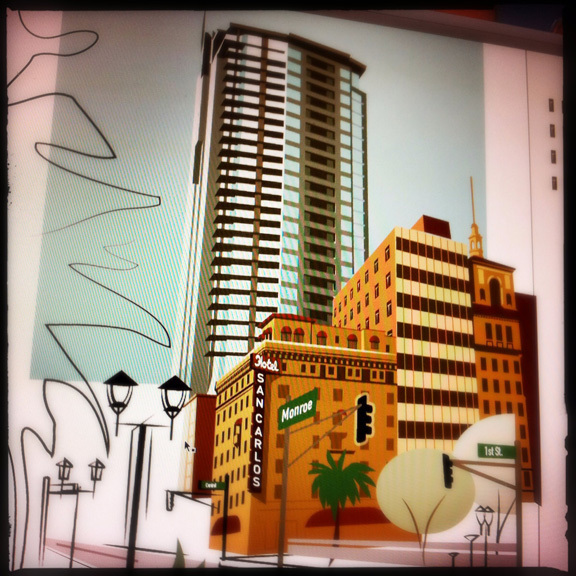 The group requested I showcase part of the Phoenix skyline and the new “Pedestrian friendly” travel lanes. These lanes keep traffic flowing but encourage better and safer access straight downtown for bikers and pedestrians. 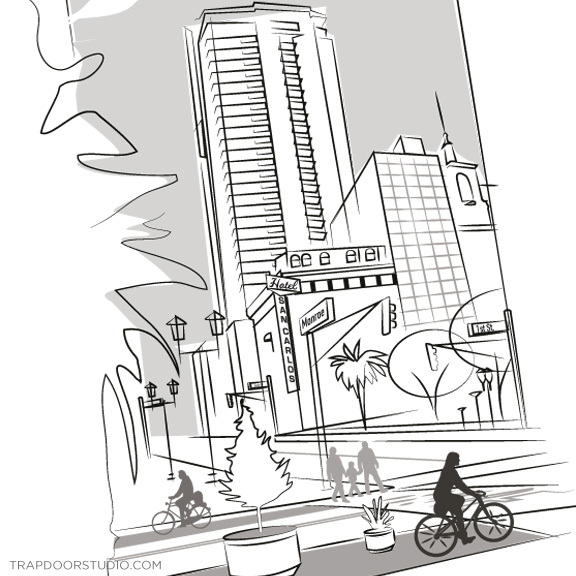 The ability to cross through downtown traffic on a bike is important in a city this large. I posted some process screenshots on social media as I worked through all the details. So many windows! 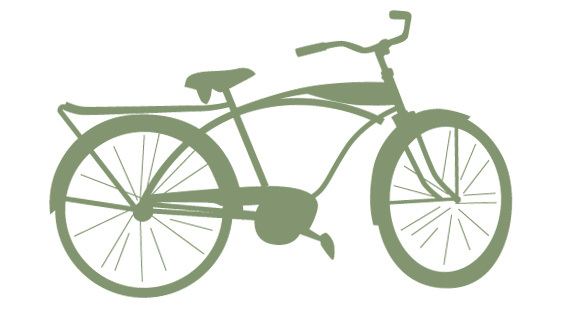 drew out a few bike silhouettes, I love these old-style frames. The 44 Monroe building towers over the adjacent buildings. It worked well in this narrow vertical format. Light rays and some fluffy clouds complete the scene and play well against the warm buildings. Trees act as a grounding element and show off some of the foliage that still needs a little time to mature. The new pedestrian friendly corridor streets are highlighted in purple and large green planters to help car traffic stay in the center lanes. I even managed some ink on the press release. 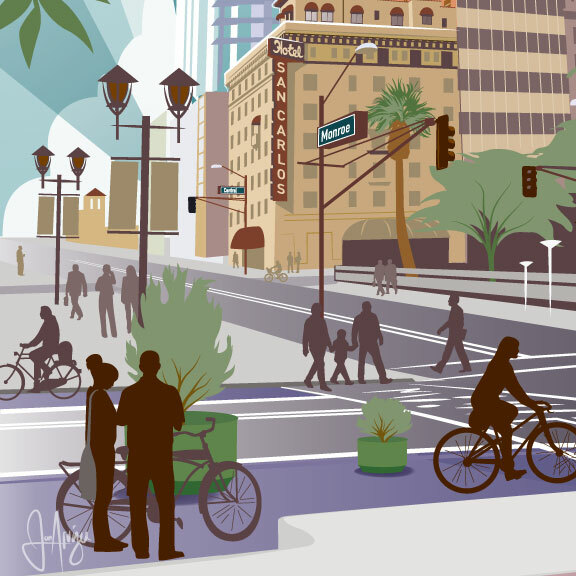 Truly enjoyed working with Ana Consie at the Downtown Phoenix Organization, and Mary Scanlon at Ember design on this one! if you like this article, you’ll also enjoy Haboob Buster and the Live Your Life poster.